I had the airplane from 10 to 3. At 9 the weather briefer began by informing me that it was instrument flying conditions throughout my entire intended route. Aw, jeez. But then he began to look more closely and figured out that the fog was going to burn off by 10 and the low clouds might blow away to the north, so maybe it was going to be marginal VFR, and maybe I could go after all. I got the rest of the briefing (wind aloft at 3000 light and variable), thanked him, and headed for the airport under broken clouds at about 600 feet, hoping for the best. By 10, the fog was gone, but the clouds were broken, so I checked the weather once again--it looked more promising--and preflighted the airplane. Powered up my GPS and announced, "Chesterfield traffic, Cessna one two niner zero two departing one five to the south, Chesterfield." Throttle to full. Engine instruments in the green, airspeed-- airspeed-- the needle didn't move didn't move didn't move ah! popped up to 60 mph--airspeed is alive. I leveled off 500 feet below the first cloud, and was only 1200 feet above the ground--legal, but not entirely comfortable, because ahead there was nothing but clouds. Turned to my heading, which was to take me through a narrow corrider between two MOA's. I was using the GPS to navigate and looking at a moving map display on my Palm Pilot, in a program called Flying Pilot, into which I had scanned a WAC (World Aeronautical Chart, similar to a sectional chart, but with twice the scale), so I could see my location exactly on the chart as I followed the course line that the program had laid out for me. Then I made a slightly disconcerting discovery. In my concern over the weather this morning, I had forgotten to figure my speeds, distances, and times in my flight log. So there was no way to tell for sure whether or not I was on schedule or when I could expect to arrive at my checkpoints. All of a sudden I felt very stupid and lost. Of course, the GPS and the moving map display were taking good care of me, and I did know where I was. But if the GPS were to quit--well, I'd rather not think about that. But that's exactly what I HAD to do, because the last thing you want in an airplane is a surprise like that. So I did some quick figuring and came up with a few reasonable approximations, jsut to be sure. The navigation problem--and one of the reasons I'd wanted to make this particular trip--is that there are very few good landmarks along this route. It's mostly over woodland, with few roads or towns or powerlines--the things you might be able to pick out from the air. So navigating by pilotage--figuring out where you are by looking at the ground and the map--is somewhat tricky there. And that's exactly what I had intended to practice today. After about 20 minutes the GPS said it was time to turn to a different heading, between the MOA's. About 20 mintues later it said I was getting close to Buggs Island Lake, and sure enough, I could see faint silver patches just below the horizon. The coulds, by the way, were up to about 2000 feet by then, so I was able to go up and see a bit farther. Down at 1000 AGL, you can't see very far. This is a view of W63 from the south. I took the photo after departing on runway 22. I approached from the far side--the north. I couldn't raise anyone on UNICOM, and there was no traffic, either on the radio or--apparently--in the traffic pattern. the windsock hung straight down. I flew over midfield at 1500 feet, swung around to the right, and entered on downwind for runway 04. The runway is paved, 4500 feet long and 50 feet wide. There's a warehouse on the 22 end and a lake on the 4 end. There appeared to be a slight slope uphill from the 4 end. Turned base. Everything looking good. Turning final, just rolling out--and suddenly there's a big hawk heading in from my right, immediately in front of the prop. The hawk is looking down, probably hunting for lunch. Oh hell this is going to be--but then the hawk saw me, folded its wings and did a flip and jinked away, missing the prop by possibly 15 feet..
After that, the landing was uneventful--although I came in fast and floated nearly a third of the way along the runway before ol' N12902 finally ran out of energy and settled down onto the asphalt. Aha! A Texaco station-convenience store was almost directly across the road. I ambled over, but the clerk said, "No restrooms." She also said, "No restaurants. There is one, but it's closed on Monday. Burger King in town, a mile and a half or so." I headed for town, walking along the broad shoulder of the new four-lane divided highway. I'd been anxious about the weather earlier, but by that time, the sky had cleared and the the sun was shining very very brightly. That was both good and bad. If it had been cold, the walk would have seemed much longer. But I was also thirsty--why is it that we want to move fluids in and out at the same time?! Oh, look at all those lovely seaplane landing sites! Gotta get that SeaRey finished! 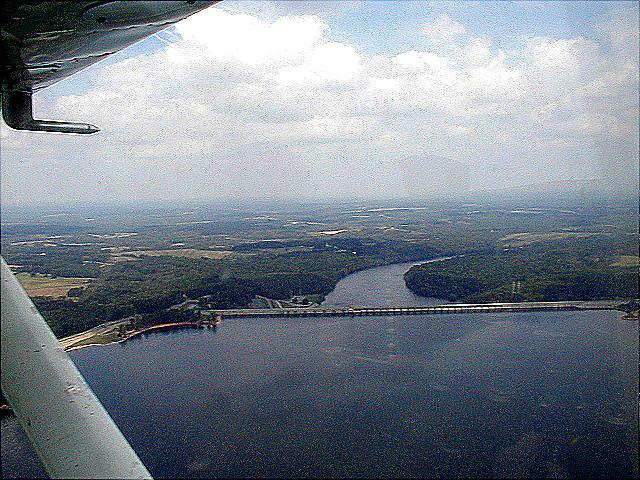 that separates it from the lower reservoir, Lake Gaston (which is ahead in this photo), then turned north and had a pleasant trip back to Chesterfield County Airport. Two hours of cross-country time, two landings, one nice day.